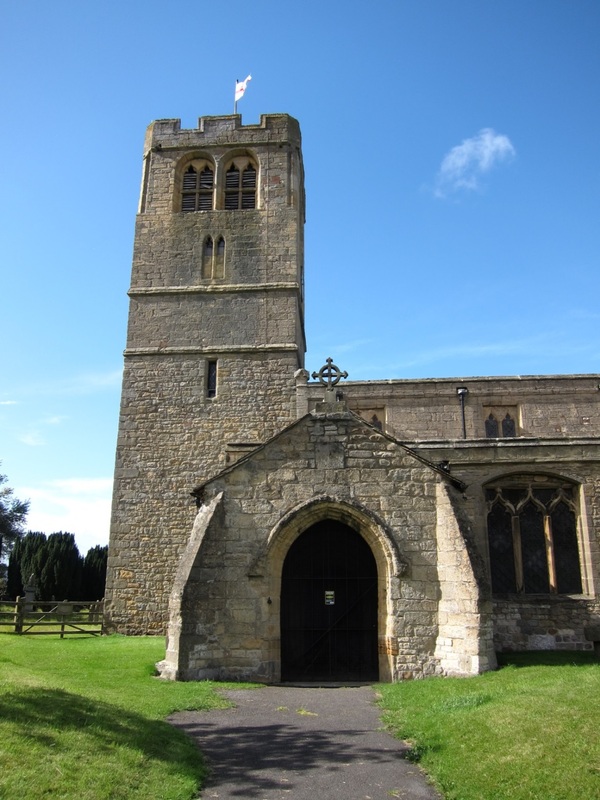 The Church of St Michael and All Angels, Well, North Yorkshire is in a tiny village between the A1 and the A6108. It is best accessed off the A6108, travelling north from Ripon. The Church is usually open to visitors. Well was the village closest to Snape Castle, and thus under the control of the Barons Latimer. A Grade 1 listed building, predating Snape by about 100 years, the Church was built by Sir Ralph Neville, sometime in the first half of the fourteenth century. Sir Ralph was the ancestor of the Earls of Westmoreland and also the Barons Latimer to which branch of the family Snape and its environs descended. As the nearest parish church to Snape, the Latimer Nevilles would have been baptised here and the Church contains the remains of their chantry. John Neville, 3rd Baron Latimer, and husband of Katherine Parr, left money for the maintenance of Well Church in his will, and also for a grammar school to be founded. Inside the Church, there is a marvellous font, with very decorative panels surrounding the base, showing scenes of the seven sacraments. 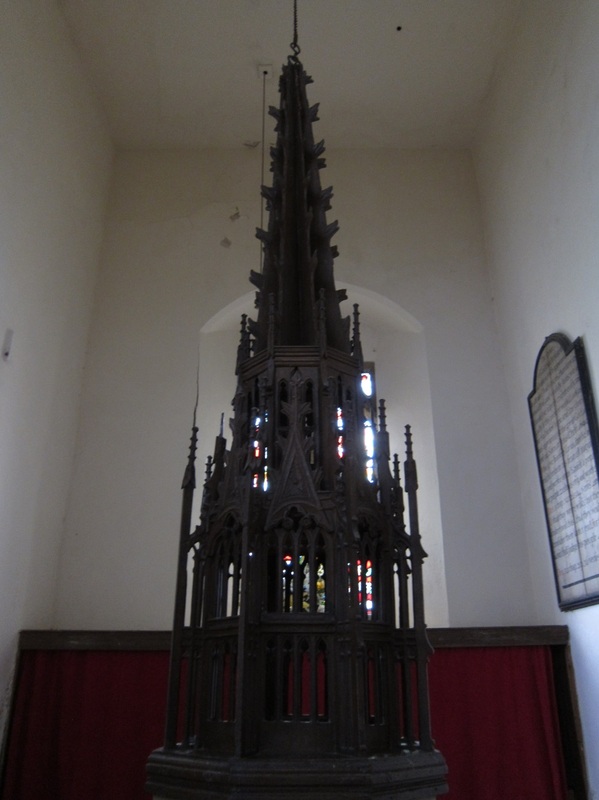 The font cover, although originally 14th century, and perhaps the very one which was in place when the 3 rd Baron and his children were christened, was heavily restored in 19th century, and it may be a question as to whether any of the original is left. In the north east corner is the Neville chantry chapel. The tomb of John Neville, 4th Baron Latimer is there, with an effigy of him in his armour, ruff still crisp after four hundred years. Around the tomb are the shields of his four daughters, two impaled with the arms of their husbands, and two with the dexter half blank - perhaps the tomb was constructed before their marriages. Tomb of John Neville, 4th Baron Latimer. 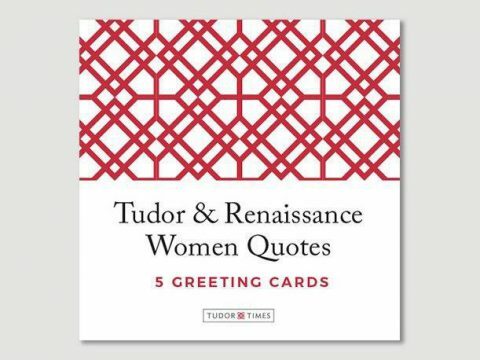 Katherine Parr's step-son. 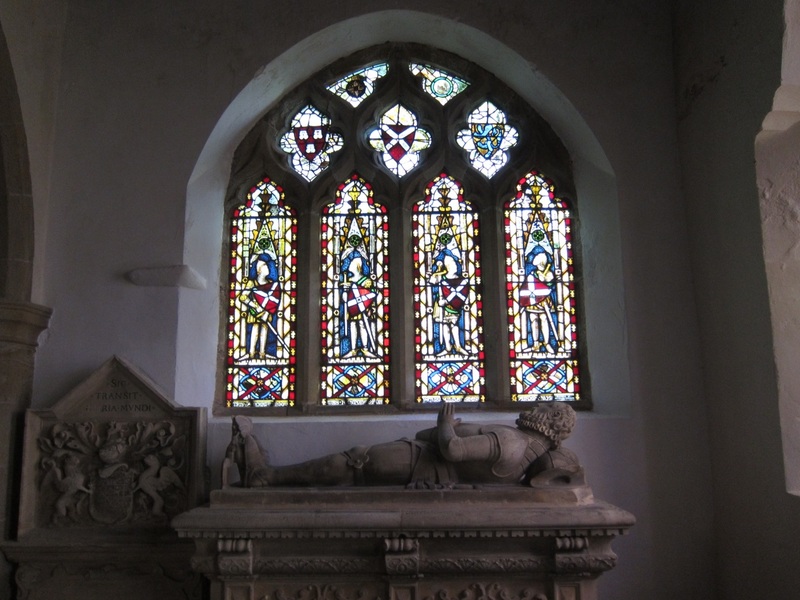 The window above the 4 th Baron is original fifteenth century stained glass, representing the arms of the three leaders of the English forces that defeated the Scots at the battle of Neville's Cross in 1346. The shields of Percy of Northumberland (Or, lion rampant azure, armed and tongue gules), and Lord Ros' (gules, three water bougets argent), flanked with the gules, a saltire argent of Neville.